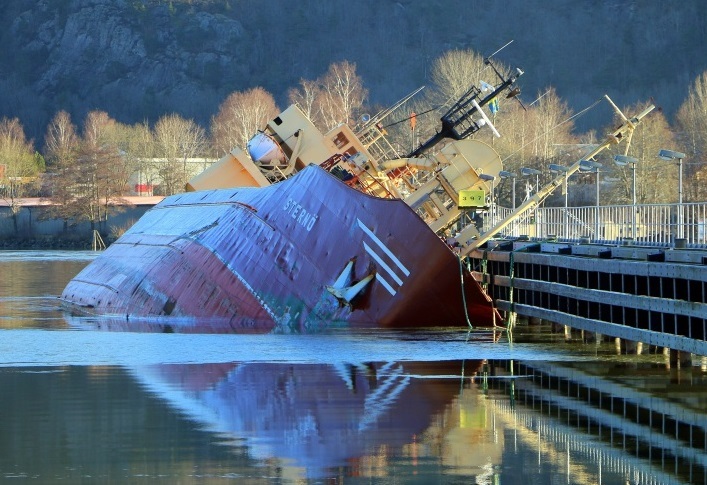 The general cargo ship Sterno partially sank after grounding at sandbank of Gota river at Lilla Edet locks area, Sweden. The vessel, carrying cargo of grain to Gothenburg, was proceeding upstream the Lock and just before switching pilots suffered massive water ingress and breaches, stucking at the sandy shallow. The general cargo ship Sterno has large list to port board, touching the bottom and pier. The accident was reported to the local authorities and at the scene were sent salvage tugs and rescue boats, which should stabilize the vessel. The traffic at Lilla Edet locks area is seriously affected and hampered during the salvage, but vessel stuck outside the shipping way. The reason for grounding is unclear, as either the ship suffered mechanical failure or stuck in the sandbank intentionally to avoid sinking in the fairway. The local authorities initiated investigation for the root cause of the accident. There are no reports about injured people and water pollution. The general cargo ship Sterno (IMO: 7035420) has overall length of 75.69 m, moulded beam of 11.00 m and maximum draft of 4.20 m. The deadweight of the vessel is 1,372 DWT and the gross tonnage is 1,300 GRT. The ship was built in 1970 by Apol shipyard in Jakarta, Indonesia.